This Sri Lanka 3 week itinerary is based on travel to Sri Lanka during July and August. You may see other Sri Lankan itineraries for other months are quite different. 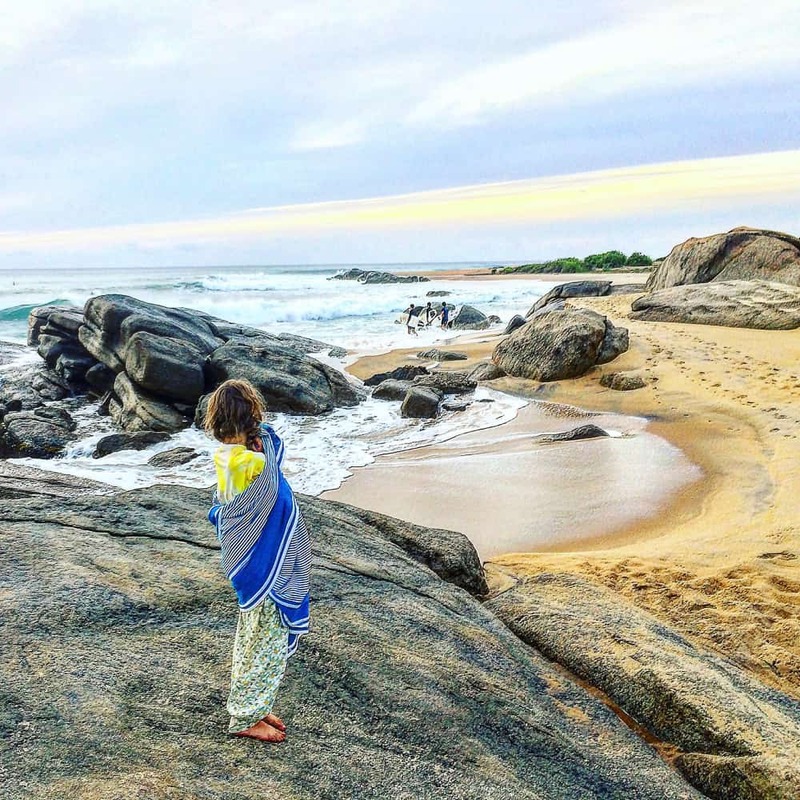 This is because Sri Lanka is an all year round destination – meaning when it’s monsoon on the West coast, you can bathe in glorious sunshine on the East and vice versa. 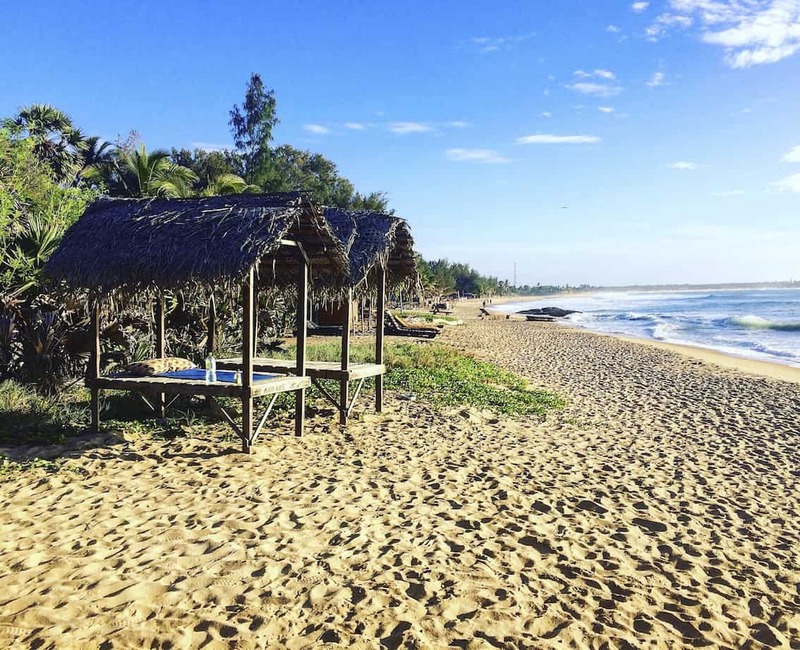 So – the first thing you need to decide when visiting Sri Lanka is what months you’ll be heading there, and this will then dictate which areas of the country you will travel to. 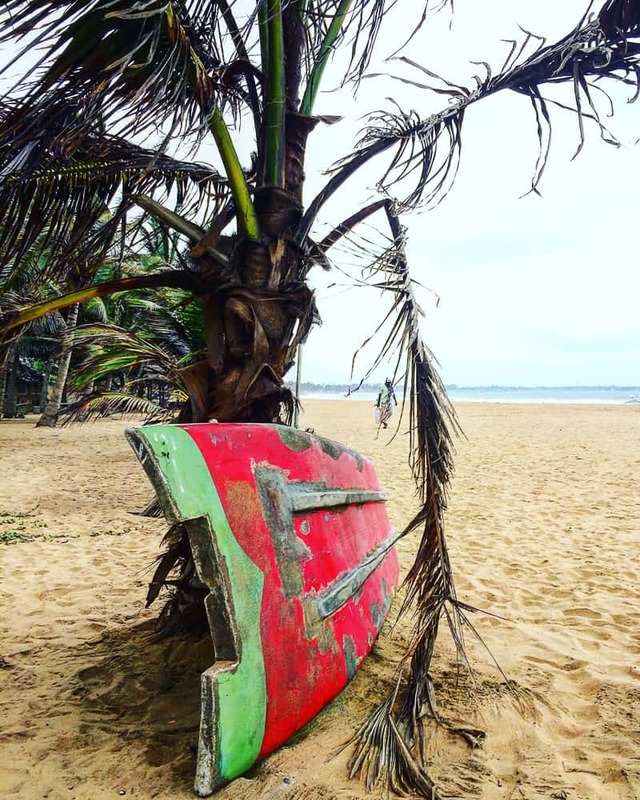 We wanted our Sri Lanka 3 week itinerary to combine culture, wildlife and surf so it made sense geographically to hit up the culture spots in the centre of the island, followed by safaris and then make our way over to the East Coast to surf. This way we avoided the Yala monsoon which hits the West & South coast from May to September. Elephants! One of the best things about Sri Lanka is being able to see elephants in the wild. We came across three on this road munching on fruit that had fallen off the back of a truck! 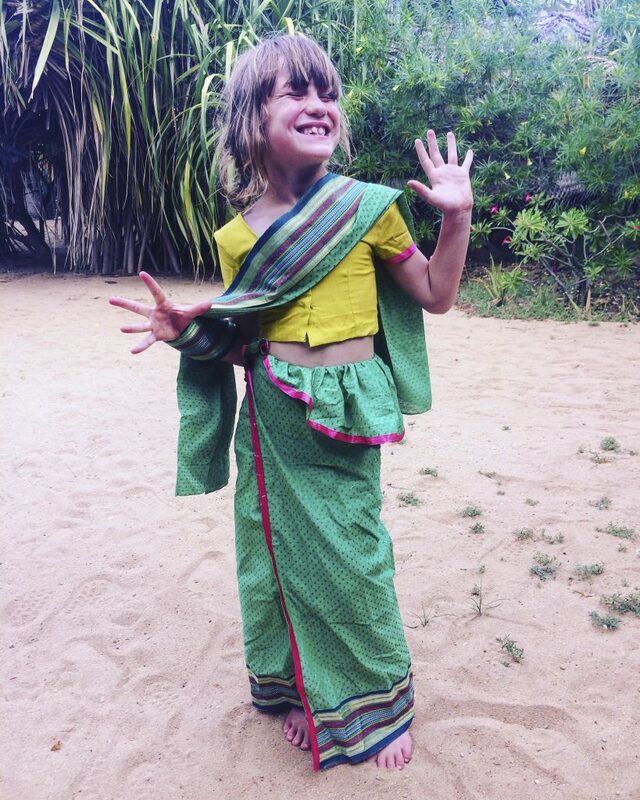 Getting a sari made up – perfect for little girls! Briefly our Sri Lanka 3 week itinerary heads immediately inland to explore ancient temples and culture in Kandy and Sigiriya. Followed by a safari to witness ‘the gathering’ – the largest natural meeting of elephants in the world at Minneriya National Park (a short drive from Sigiriya). Heading back to Kandy we catch the train to Ella and take what is argued to be one of the most beautiful train journeys in the world (we weren’t disappointed). Ella, in the heart of the hill country is the perfect place to visit the surrounding tea plantations, and do some stunning hikes before heading to the south west to Katagarama, for another safari in Yala National Park – this time to attempt to glimpse the elusive leopard. 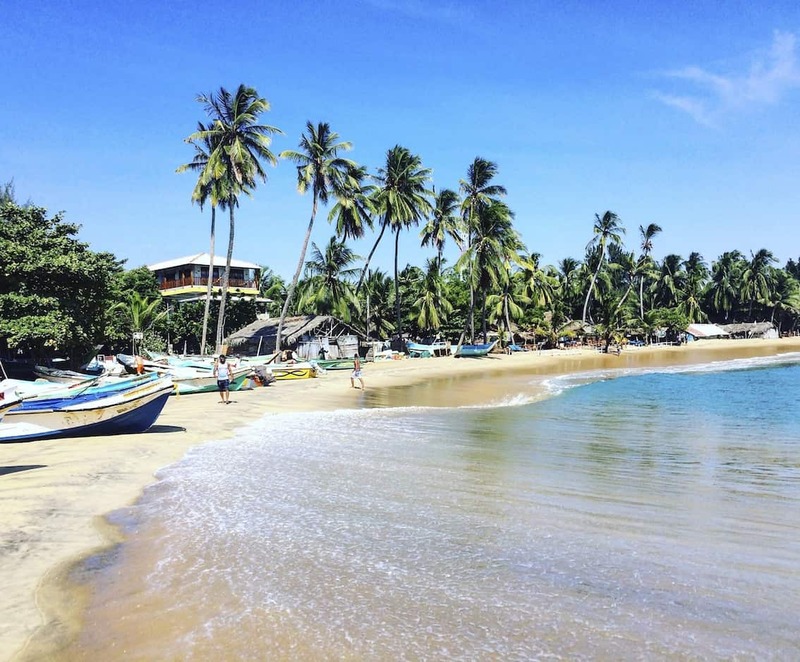 To finish this Sri Lanka 3 week itinerary head to East coast to famous Arugam Bay for sun, surf and chillaxing. This 3 week Sri Lanka itinerary takes in temples, hiking, safaris, beach & surf spots. Our Sri Lanka 3 week itinerary is based on travelling as a family, so we’re travelling a bit slower than maybe a couple or solo traveller. We’ve worked in our golden 3 night rule as often as possible to allow the kids to settle in and us all to relax, rather than being on the go all the time. However, couples or solo travellers might want to speed up some of the itinerary so I’ve added suggestions here and there for those travelling without kids. 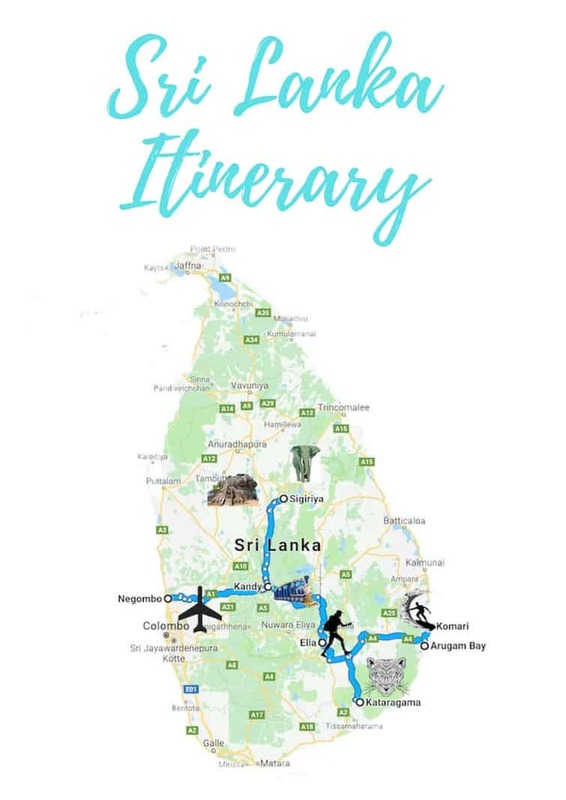 Further below our Sri Lanka 3 week itinerary we’ve included information on transport and getting around and a section on costs in Sri Lanka and what you can expect to pay for accommodation, transport and basics whilst travelling Sri Lanka. Sri Lanka is the perfect place to explore if you’re looking for more than just sun and sand on your holidays. Tropical, incredibly diverse and super friendly this little country is perfect for adventuring families. Just a stone’s throw from the tip of southern India, here in Sri Lanka you can see incredible wildlife (on affordable safaris), surf world class waves and get a serious culture fix. 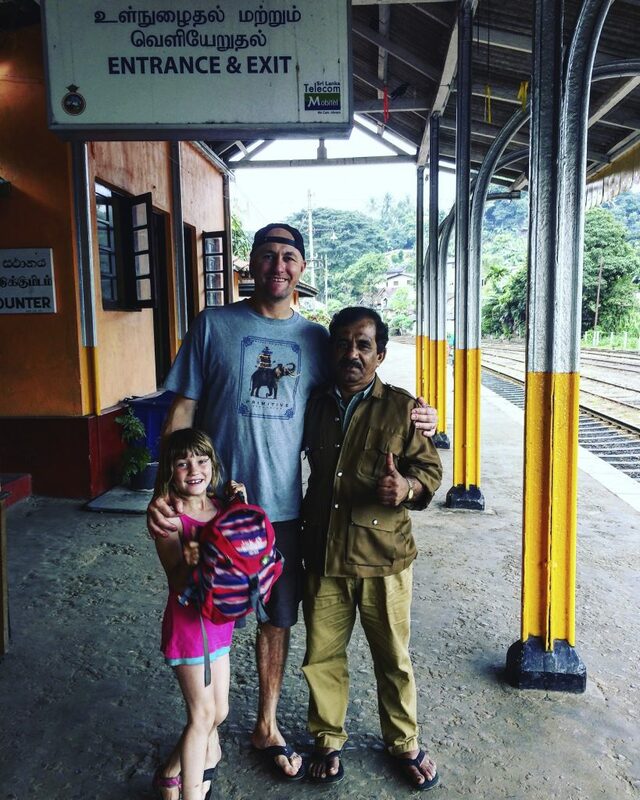 Adventure family travel is easy in Sri Lanka – the Sri Lankan’s absolutely adore kids and the country feels very safe to travel around. If you’re not fussed about seeing the capital, Colombo, (which is supposedly underwhelming) head straight to the coastal city of Negombo from Bandaranaike airport It’s nearer the airport than Colombo and being on the coast is a much more relaxing place to recover from the long haul. We stayed just one night here at the basic, but perfectly adequate Marine Tourist Guest House in Negombo and paid $46/£36 in an air-con room with two double beds. 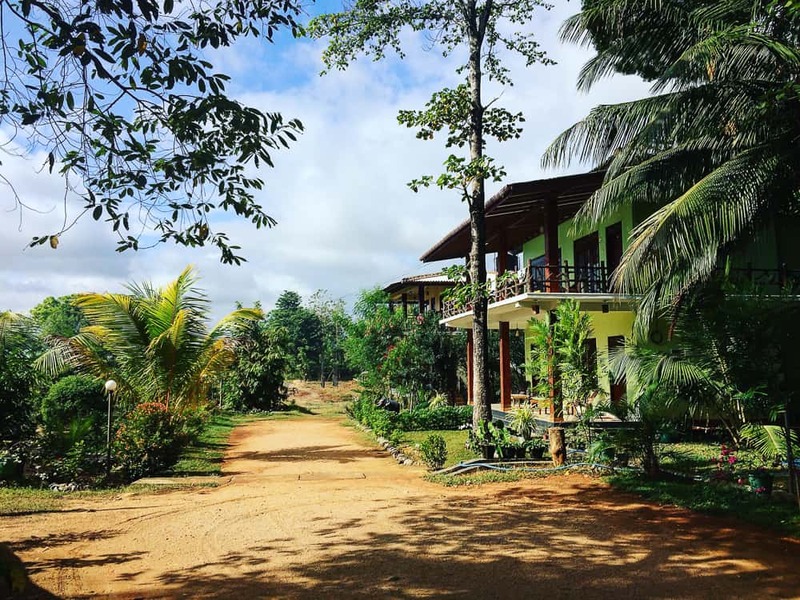 The guest house is only one road back from the beach and is a 2 minute walk to the amazing Seajoy restaurant which we would fully recommend for your first night of delicious Sri Lankan food (Rs3600/£18 for four of us). We didn’t stay in Colombo but if we had done, I think we would push the boat out and spend the night at the famous colonial hotel Galle Face Grand. What I would pre-book is the train from Columbo to Kandy for your second day, although it means an early start with a departure at 7.00am. If you arrive on a late plane and you want to catch the early 7am train, I’d suggest spending 2 nights in Colombo or just 1 night and catching a later train. I talk more about booking this train and other transport options at the end of this itinerary. Q – Should you book your accommodation ahead of arrival? I’d advise you to definitely book your first night of accommodation before arriving in Sri Lanka. After a long haul flight with exhausted kids, the last thing you want to be doing is dragging them around to find accommodation. During peak season of Christmas/NY and July/Aug it’s advisable to book ahead if you have your eye on a specific accommodation and don’t want to be disappointed. A lot of the good places do book up far in advance for these periods. If you want to be more flexible with your itinerary then be sure to book at least a few days ahead of schedule. Day 2 is a travel day from Negombo (or Colombo) to Kandy. Kandy is the cultural capital of Sri Lanka and location wise is slap bang in the middle of the island. It’s perfectly situated as a stepping stone to the East coast and is brimming with temples and culture. We decided to visit the culture spots first as they all seem to be either in or just north of Kandy. From Negombo to Kandy we booked a private taxi with our accommodation the night before. It cost us Rs8,750 (£43) and takes approximately 3.5 hours (although always allow longer in Sri Lanka when driving by car). If we had stayed in Colombo I would recommend taking the train (Rajhadani Express) from Colombo to Kandy. You can pre-book it up to two weeks in advance (even if you are not in the country) with www.seat61.com or 12GoAsia. There are details of how to book this train at the end of this itinerary in the Getting Around Sri Lanka section. Spend 2 nights in Kandy to really recover from the flight and soak up true Sri Lankan culture. You can easily cut this down to 1 night if you’re not travelling with kids. You can read our post here Things to do in Kandy. I’ve heard that many travellers choose to omit Kandy from their itinerary, labelling Kandy as polluted, busy and noisy. Yes, Kandy is a large city but we enjoyed it – we stayed in a homestay style hotel so it was great for our girls’ first experience of Sri Lankan food, hospitality and of getting a sari made up from a tailor (highly recommended). 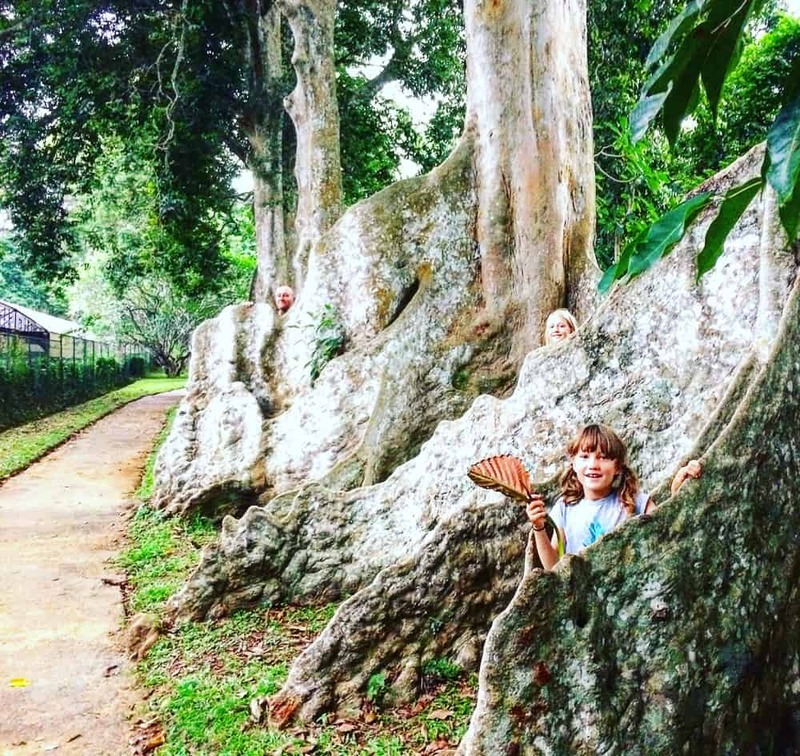 The botanical gardens in Kandy are the perfect place to let your kids run wild and to start relaxing into your Sri Lankan adventure. This is us hiding behind the huge almond tree trunks! In Kandy, visit the lake and the botanical gardens. We always love visiting botanical gardens as a family when we’re on our travels. The kids can run and play and it’s always a gentle intro to a country. 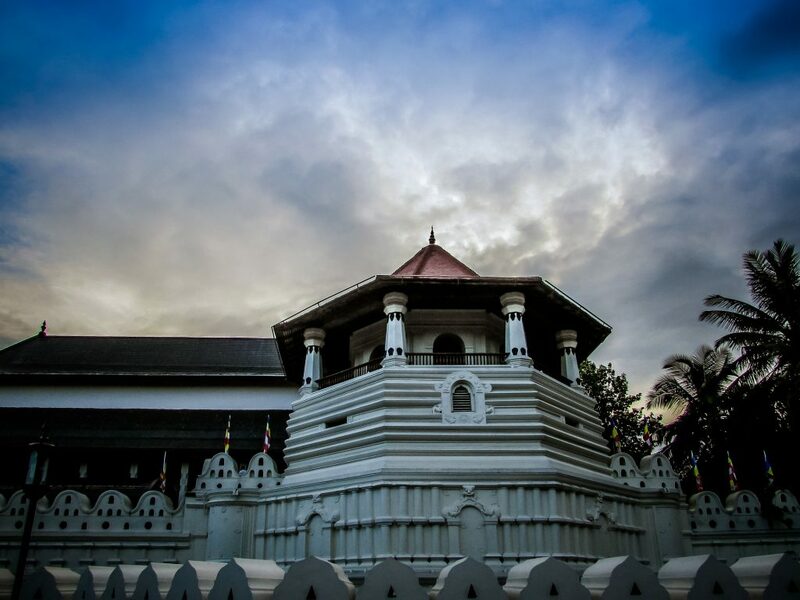 Here in Kandy is one of Sri Lanka’s most revered temples – the Temple of the Sacred Tooth Relic (UNESCO site). We didn’t visit but just saw the outside whilst walking along the lakeside. We chose not to go in the temple as we’d actually seen the sacred tooth relic being paraded along the streets of Kandy on the night we arrived. We’d unsuspectingly arrived on the finale of the 10 day Buddhist festival Esala Perahera (and paid quite a lot of money for seats to watch it!). We stayed with the gracious Kumari from Madugalle Family Friendly Guest House (or sometimes it’s referred to it’s old name, Kandy Inn). This large colonial house is slap bang in the middle of Kandy so very near to the key sights, namely the lake and the Temple of the Tooth. Black and white portraits of seven generations of Kumari’s family stare down the walls whilst we took delicious breakfasts of toast and pineapple jam with fresh mango. We were fascinated by the family’s history and by Kumari and her family’s hospitality and charm. Nothing was too much – she insisted on booking us tuk tuks from the accommodation so we would get the right fare and not be ripped off and was delighted to organise our tailor visit, even forwarding the finished saris to our Arugam Bay accommodation. Basic accommodation (no aircon) but lovely welcoming family vibe. 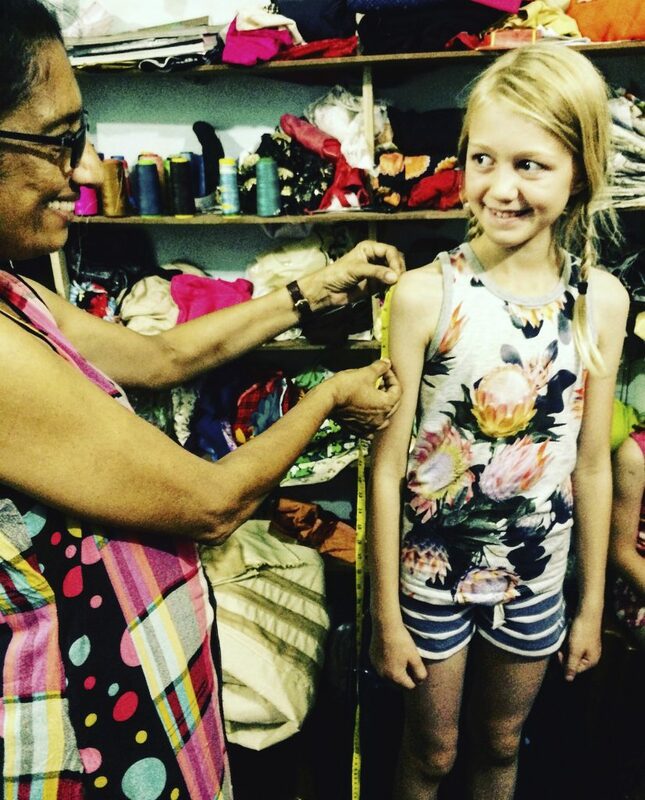 One of the best things we did in Sri Lanka was choosing material and going to a tailor in Kandy to have saris made for the girls. We paid Rs2100 for the material and another Rs2000 to the tailor. Our tailor’s name was Mahashi. If you’re interested in contacting her, DM me and I’ll pass on her phone number. Ask your guesthouse to call Mahashi and then take a tuk tuk to meet her to get your girls measured. Then she will send one of her helpers to go to the material shop with you to choose from the rolls of beautiful fabric. It was easy and everyone was so helpful and lovely – particularly in the material shop where we were quite the novelty. Day 4 is a travel day from Kandy to Sigiriya with a visit to Dambulla Caves which is directly en-route, one hour before Sigirya. It’s a 3 hour drive (without stops) with a private driver, so estimate around 5 hours in total taking in Dambulla Caves as well. Your driver will stop and wait for you while you climb the steps and see the caves. Yo will also have the opportunity on the Kandy – Sigiriya road to stop off at some of the spice gardens en-route, which is an interesting but not a vital stop. The spice gardens are free to enter but there’s a hard sell at the end for overpriced products. 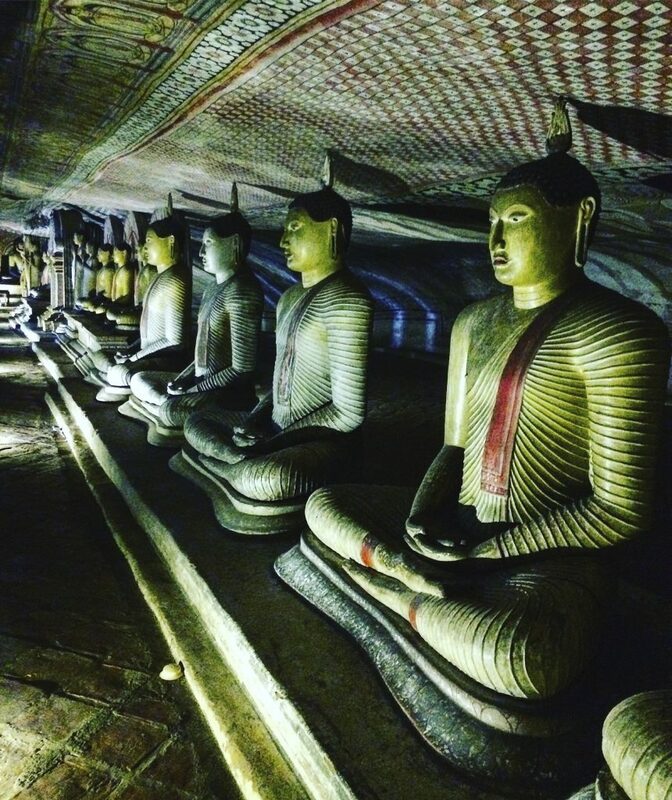 Dambulla Caves, an hour from Sigiriya, is well worth a stop to marvel at the amazing array of Buddhas. It was here that our girls learnt never to turn your back to Buddha – it’s a sign of great disrespect. Spend 3 nights in Sigiriya to climb either the famous UNESCO Lions Rock or the alternative (and more adventurous climb – Pidurangala Rock. You can also use Sigiriya as a base to do a safari in the nearby (1 hour away) Minneriya and Dambulla National Parks. Day 5 – Get up at 4am to climb Pidurangala Rock to summit at sunrise. Head torches are necessary! You can read our post here on our Pidurangala Rock climb. The view from Pidurangala Rock of the famous Lions Rock is astonishing. Seeing dawn break on top of this beautiful mountain as well as the adventurous climb up in the dark was one of our most precious moments in Sri Lanka. If you have young kids we’d definitely advise the Pidurangala climb over Lions Rock. 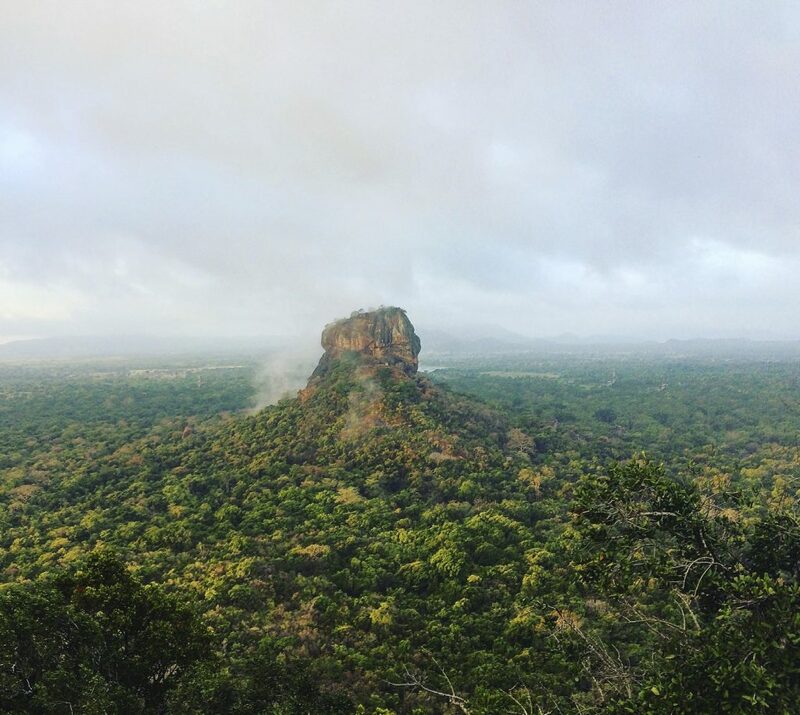 If you wanted to cut down your time in Sigiriya, it’s possible to climb Pidurangala at dawn, visit Lions Rock in the afternoon and do an evening safari! We don’t recommend this with kids though and even the thought of that is exhausting! 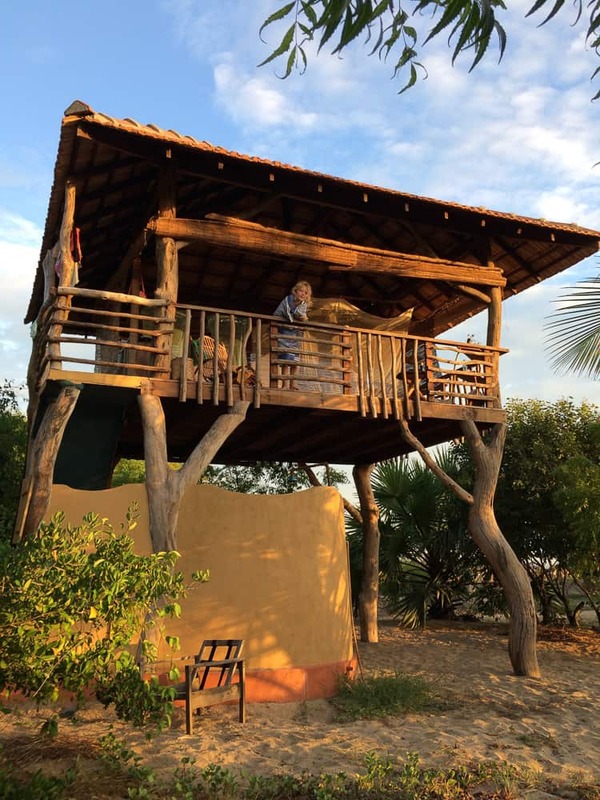 We could have easily spent only 2 nights here climbing Pidurangala at dawn, departing at noon for an afternoon safari and been off the following day but with 3 nights in a place, you get two full days. We wanted to take it easy and it was a great place to chill, play cards with the kids and get to know our hosts. It was here we learnt how to make hoppers, ate water lily buds (who knew they were edible?) and danced carefree in the monsoon rain. Safaris in Sri Lanka are very affordable for a family of four – one of the lures of this incredible country. Our safari to witness ‘The Gathering’ – the unique spectacle of hundreds of elephants gathering in one place – the largest in the world – was arranged by Darnshi Lodge where we stayed. We had a private jeep for our family and took an afternoon safari, leaving at 12 noon. (Evening safaris were also possible). It cost us Rs12,200 (£61) + 3,000 tip for the four of us, plus we had to pay the National Park fees upon entering. It was around an hour’s drive from Sigiriya to the park entrance. Minneriya and Dambulla National Parks are right next to each other, joined by an elephant bridge allowing the elephants to cross at any time into the other park. Minneriya is the park which has the reservoir, where the elephants congregate in August, the driest month, to drink and socialise. The safari will take you to whichever park the elephants have been spotted in recently. We were amazed to see a matriarch and her baby almost immediately on arriving into the park. 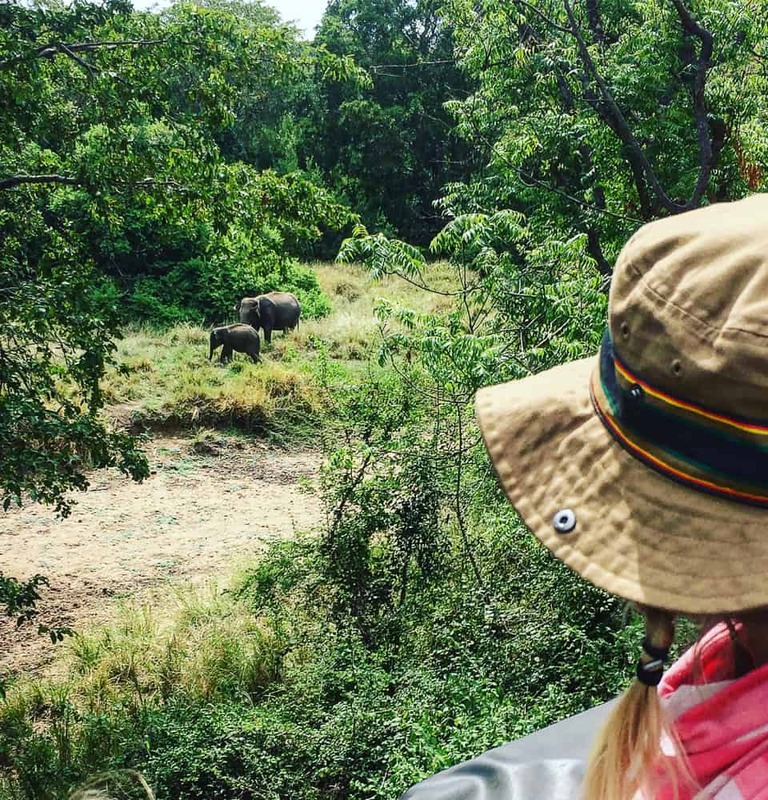 It was a true delight for my girls to see wild elephants for the first time in their lives, although the number of jeeps surrounding the elephants made me uncomfortable. We asked our driver & guide if we could leave the gaggle of tourists behind and take off on our own. We were rewarded by an encounter with a solo male who we followed from a discreet distance for over 15 minutes. Seeing elephants in the wild is an experience second to none. Talking of elephants – we were privileged to see wild pygmy elephants in Borneo during our family wildlife volunteering holiday – read about it and watch our video footage here – scroll to day 5 video diary. 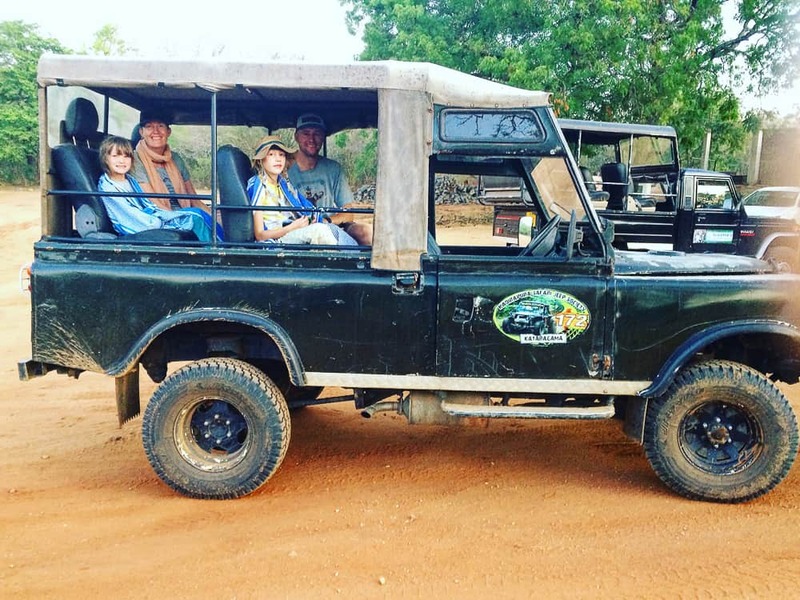 If you’re off on safari with little ones, Jenny from Travelynn Family gives excellent tips on going on safari with kids under the age of 5. We stayed just outside Sigiriya at the wonderful and highly recommended Darnshi Lodge. Wonderful service, very clean, air-con and at a fabulous price – £27 per night! We stayed 3 nights at Darnshi Lodge, which is slightly out of Sigiriya. Darnshi Lodge was our cheapest accommodation in Sri Lanka (£27 per night for an air con ensuite room) but was easily the best value for money we had in the whole of Sri Lanka. It’s family run business and it was lovely to get to know the family for a few days before moving on. We stuck to our trusty 3 day in one place rule here and didn’t regret it. One of the brothers who live here has a tuk tuk, so we could give him a shout whenever we wanted to get out and about. Unfortunately unless you want to carry on North to see further temples in the golden triangle (in the ancient city of Polonnaruwa) or head to the coast either to Trincomalee or to Batticaloa (with a view to then travelling south down to Arugam Bay), you now need to re-trace your steps to Kandy to take one of the most beautiful train rides in the world. So day 7 is a travel day back to Kandy. The train leaves early morning so it requires another night in Kandy (tonight). There’s no real way around this unless you choose to go straight to Sigiriya (instead of Kandy) on your 2nd day. This would have been too much for us with the kids in tow but it’s an option to avoid doubling back to Kandy. Arrange to pick up your saris now, if you visited the tailor on your first visit to Kandy. If not, get measured up this afternoon and have your guest house forward you the made up saris when they’re finished. This is what we did and it was a wonderful interlude, rather than feeling like we’d wasted a day in Kandy waiting for the train. It was one of the simplest and most authentic things we did in Sri Lanka and the saris will make wonderful souvenirs for my girls once they grow out of them. We spent the remainder of the afternoon going to the train station to try to book tickets for the Ella train the following morning. We were sent packing as all the reserved seats had been sold. We were told to return one hour before the train departure time the following morning to buy an unreserved ticket. The train journey is LONG but a must – even with kids. Many travellers break the journey by stopping in Nuwara Eliya, nicknamed ‘little England’ for it’s quaint cottages and tea rooms. We didn’t bother with this – we have enough of that in the UK, and did the long 7 hours to Ella in one stretch. A word of warning – the train will be completely full, particularly so in peak season. We felt sorry for others that had to stand the entire way – it would have been a nightmare with the kids, so we do have some tips to pass on about how to bag seats. First and second class tickets (both ‘reserved’ seating) can be hard to acquire in peak season. It’s possible to book online before arriving in Sri Lanka but you will pay a premium. Our trick was to board a station earlier than Kandy to avoid fighting the throng of tourists and locals boarding in Kandy. We had a tuk tuk take us to Peradeniya, which is 5.5km west of Kandy (which is where the Botanical Gardens are). We boarded the train fine and although the train was full, managed to quickly slide into seats as the crowds got off in Kandy and before the throng boarded. This LONG 7 hour journey is definitely worth it – even with kids. The scenery is stunning – just make sure you bag yourself a seat!! Day 8 is a travel day from Kandy to Ella. 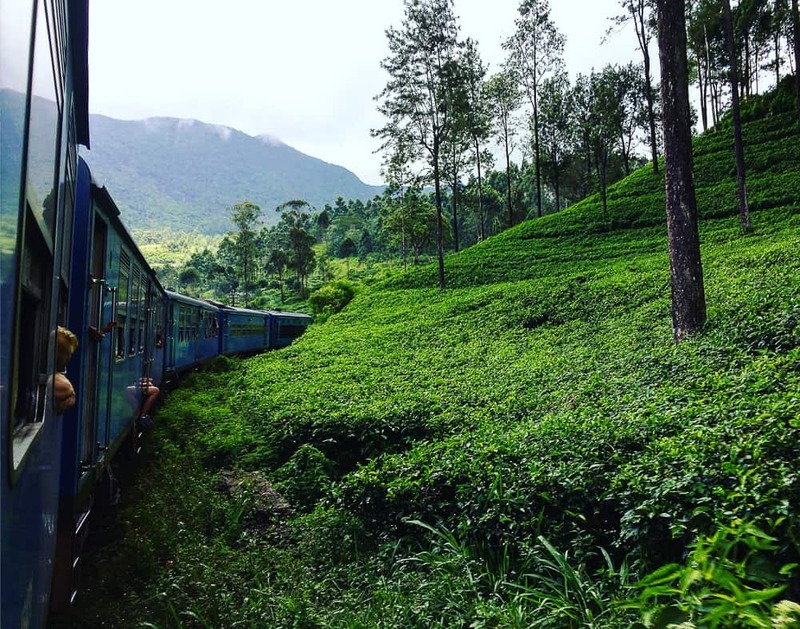 This train, famously bright blue, climbs up to the atmospheric hill country through incredible scenes of misty rolling verdant hills where tea plantations roll undulating as far as the eye can see. This train journey is a tourist attraction in itself and instead of seeing the 7 hour journey as laborious and a bore, soak up the atmosphere and watch the locals. We travelled in 2nd class unreserved so we were crammed in like sardines (we were extremely thankful to have seats) but it was a wonderful opportunity to meet the locals, who ended up squeezing onto our seat, playing lego with our girls and we even had a crowd gathered round watching a kids film on the iPad towards the end of the journey. Not me, of course, I was looking out of the window the entire time – but hey when you got kids on a 7 hour journey – occasionally needs must! It’s worth noting that it’s unlikely you’ll be able to snap any of those amazing photos on Instagram (of yourself or a pretty girl hanging out of the train) in 2nd class unreserved – simply because these carriages are rammed. It’s difficult to get anywhere and I had to push and shove to get to the doorway to take a quick snap. What is great about the 2nd class unreserved is that you’re hanging out with the locals. You will need to book the 1st class reserved (where everyone is allocated a seat and no-one is standing) if you want to take the instagram famous shots! We felt courageous and sat atop the famous nine arch bridge in Ella. This is my then 9 year old and myself above the abyss – it looks scarier than it was! Spend 3 nights in Ella enjoying the cooler climes of the hill country. Ella is a fantastic spot to kick back, relax, hike some of the famous trails. Little Adam’s Peak is an easy option for families with young children, plus on the first section you walk through tea plantations and can often see the tea pickers at work.Ella’s Rock could be managed with older kids whilst Adam’s Peak is a much longer hike. We enjoyed walking the rails and exploring the nine arch bridge. 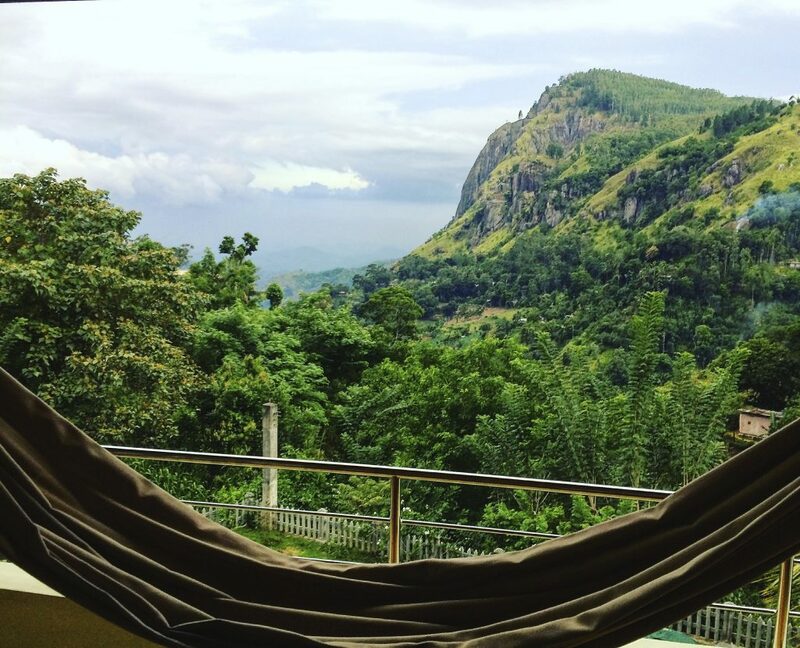 You can read our post of the best things to do in Ella here, including the best place in Sri Lanka to eat chocolate roti (and learn how to make it!). Ella enjoys a relaxed, backpacker vibe and it’s a good place to do a cooking class if you want to learn about Sri Lankan cuisine. We pushed out our accommodation budget in Ella, as so many of the activities were free. We stayed at the amazing Zion View which has jaw dropping views of Ellas Rock and a fabulous play area for kids next to their restaurant. The balconies at Zion View have stunning views of Ellas Rock! Not a bad sight to wake up to! 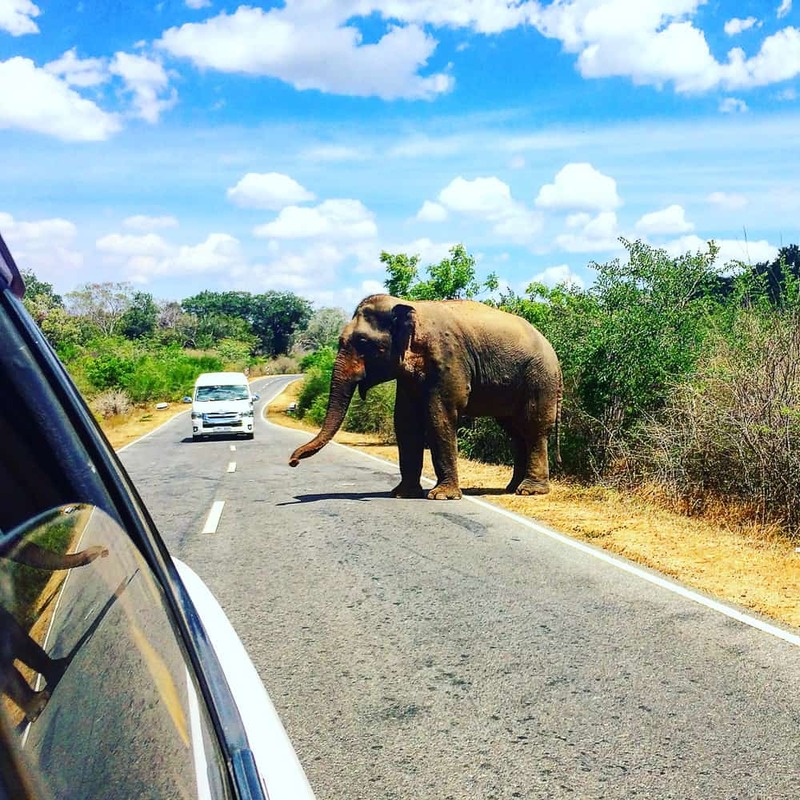 Day 11 is another travel day from Ella to Kataragama in the south east – the gateway to Yala National Park. Again we took a private driver, paying Rs6500 (£35) for the two and a half hour journey. Our goal – to glimpse a leopard. Of all the National Parks in Sri Lanka, Yala National Park has the highest density of leopards, so chances here are as high as you’ll get to try sneak a peek at this incredible creature. We booked into Cadjan Wild for one night, which lies right on the border of the National Park. We’d been given a tip to stay here by friends as with it’s location, your jeep can enter a smaller, less busy gate into the national park which meant we didn’t have to get up as early and less queueing! Cadjan Wild semi-luxury bungalows are the perfect place to bed down before a safari. The bungalows are contemporary, have air-con and have impressive ensuite outdoor marble showers. The gardens are beautifully lit with candles come dusk, where you can swim in the salt pool and watch troops of monkeys jumping in over the fence from the national park, to scoff fruit from the trees or even drink from the pool! The bungalows at Cadjun Wild on the perimeter of Yala National Park were beautiful air-con rooms with huge marble open air en-suite showers. Choose from an evening safari or a morning safari. It’s very hit and miss if you see a leopard or not and it doesn’t seem to make any difference whether you opt for a morning or evening safari. We stayed only one night here at Cadjan Wild, so we decided to take the morning safari the following day and then head on to Arugam Bay the same afternoon. Others we met decided to do both an evening and morning safari to increase their odds of spotting a leopard. It’s definitely something to consider if you’ve got older kids, and something we might do next time as unfortunately, whilst we saw tons of other wildlife, and our guide was incredible, we didn’t manage to spot the elusive creature – so it would be have been great to have tried another time. With our kids being quite young, and already having done a safari with them, we felt only doing one in Yala was the right decision. Whilst safaris are very exciting, they are also rather rough. The jeeps can be particularly uncomfortable negotiating huge ruts in the trails and ragging it around quite fast. Equip all members of the family with sunglasses and something to put over the mouth and nose – it’s vital to stop the dust getting in. 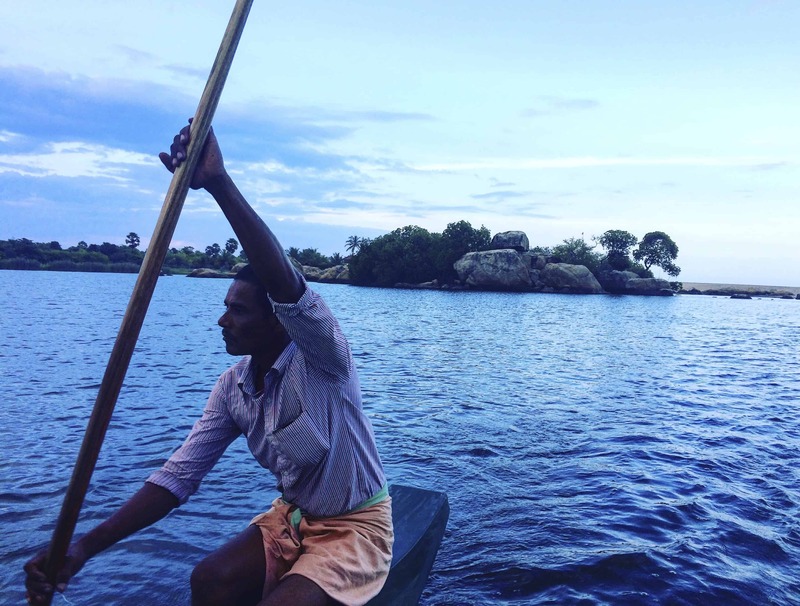 Day 12 – after the morning safari, take a private driver to Arugam Bay. Here you can relax for a whole week of relaxing by the beach and explore the secret surf spots along the coast. (The journey from Kataragama to A Bay will take approximately 3.5 hours and we paid Rs10,000 (£50). Baby Bay is a section of beach right in the crux of the crescent shaped bay of Arugam Bay. It’s a safe place for kids to swim as it’s lovely and shallow. You’ll see lots of beginner surfers here too. Arugam Bay is a stunning crescent bay of golden sand with the best surf in Sri Lanka. This laid back, one street town is the perfect place to kick back and chill for a week. A Bay, as it’s affectionately known is full of yoga classes, cool cafés, and world class breaks. Catch tuk tuks out to Arugam Bay’s surrounding surf spots with wonderful names such as Peanut Farm, Elephant Rock or Whiskey Point. 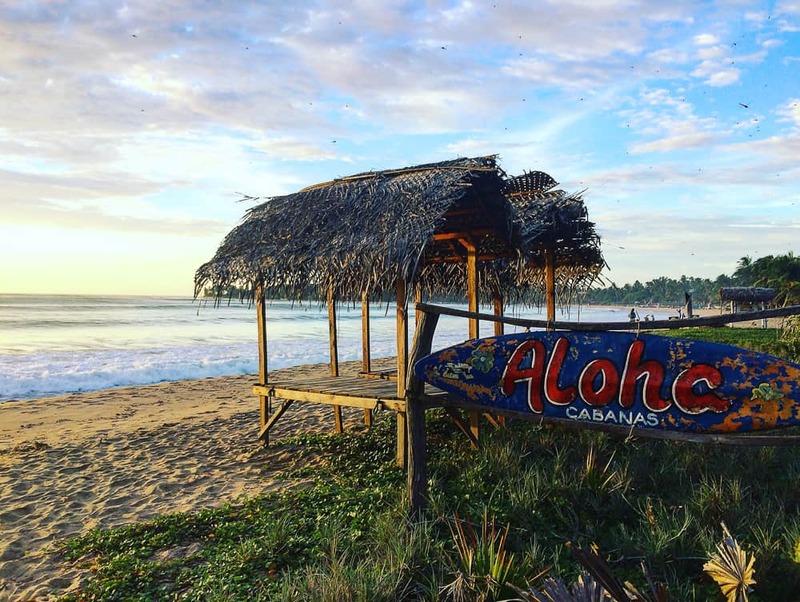 Aloha Cabanas in Arugam Bay was a tip whispered to us by some buddies on the surf scene. Here you can roll out of bed and into the surf, their cabanas are super affordable and staff uber friendly. Cabanas book out quickly so book ahead of travelling to Sri Lanka. We stayed in the wonderful beach side Aloha Villas in Arugam Bay. Literally wake up and fall out of bed onto the beach and the thundering surf. Cabanas are basic with fans, but great for location and your wallet. The friendly staff will pop down a mattress for you free of charge for the kids. We spent a good week here before we moved literally 100 metres up the beach to Roccos for the relief of aircon and pool for the kids, although this comes with a price. We also stayed at the luxurious Spice Trail on our way back which was heaven! The best place to stay if budget isn’t your concern is Hideaway Villas – these are cool vibes slash boutique bungalows at their best. Unfortunately Hideaway was fully booked during our visit but we still took the opportunity to visit their pool for a small fee and their uber cool cafe bar. If budget is no issue, stay here. It’s around 4 hours to drive from Kataragama to Arugam Bay. I actually arranged our whole trip around staying at this incredible place – Hilltop Cabanas at Lighthouse Point, Komari (about 30 minutes north of Arugam Bay). It’s one of the few places I pre-booked from the UK. You’ll see why if you read our full review on Hilltop Cabanas here. It’s quite simply a slice of paradise! 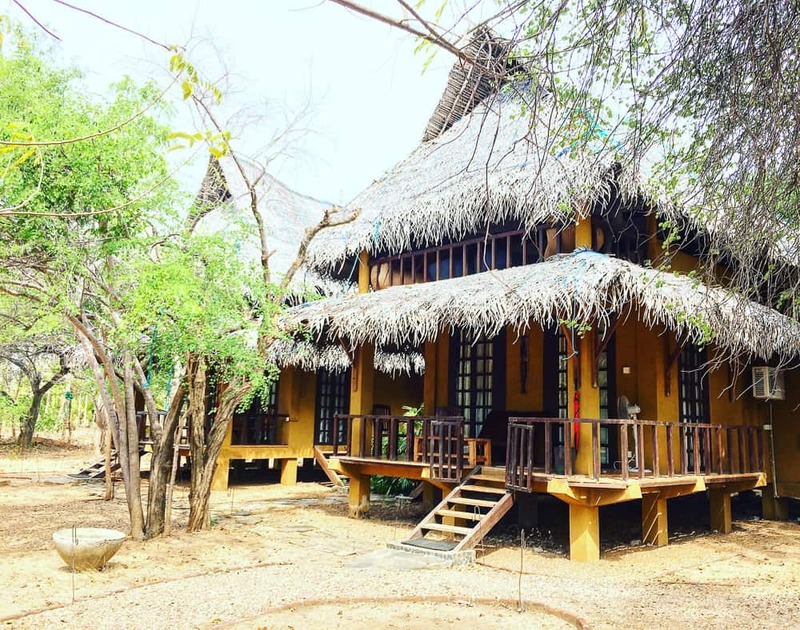 Their rustic cabanas are perched on stilts and are open air with nothing but mozzie nets between you, the moon and the ocean! Do absolutely nothing here but surf, collect shells, swing in a hammock, read a book or play chess. Take in the breathtaking remote location and enjoy the isolation. If you don’t surf then maybe only stay one or two nights, just for the experience. If you have longer on your itinerary or if you’ve spent less time in any of the spots above, I’d recommend travelling up the East coast and exploring further all the way to Trincomalee. From there you can catch a train back to Colombo (7 hrs, although don’t take the night train without a male chaperon) so can complete a loop rather returning to Arugam Bay to get a transfer back to the airport. Alternatively catch a private cab for around Rs20,000. Return to Arugam Bay via tuk tuk to pick up a private cab directly to the airport. We ordered one for 4pm which got us there in time for our late night flight back to Heathrow. We always use a trusty Lonely Planet guidebook when we’re on our travels. I’m a big fan of Lonely Planet and have been using them for years. This newly published Jan 2018 Sri Lanka Lonely Planet guidebook will be invaluable to you on your trip. 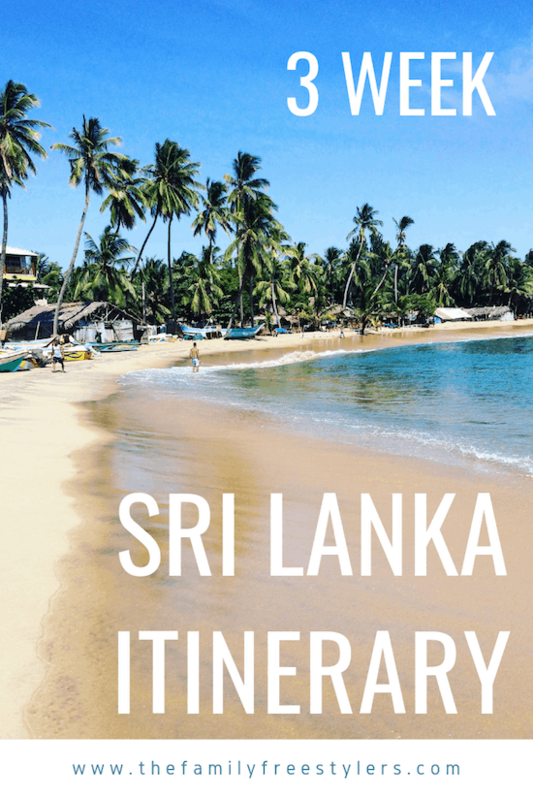 This is our Sri Lanka 3 week itinerary – choose to use this exact one or cut and paste into your own schedule as you wish. One option is to spend less time in Arugam Bay and then spend 3-4 days travelling up the East Coast to Trincomalee. From here you can catch a train back to Colombo. Whilst researching this route it became clear that the sleeper train is no longer running, although the night train still does. I’ve heard it’s not safe to travel without a male chaperon so if you’re ladies travelling solo, catch a private cab or get the day train. There are supposedly two international airports in Sri Lanka – Bandaranaike International Airport (CMB) 35km from Colombo and Mattala Rajapaksa International Airport on the South coast. I researched into flying into Mattala Rajapaksa as geographically, it would have been easier for our itinerary, but it was way more expensive and so as most people do, we flew to Bandaranaike. From the airport, if you’re after an immediate authentic experience, walk onto the road outside the airport to catch a tuk tuk to Negombo – yes a family of four can squeeze into one (note tuk tuks are not allowed into the airport so you will have to walk outside onto the road where they queue on the opposite side). Expect to barter hard. I’d read reports of fares being as low as 800 for a tuk tuk to Negombo but we only managed to get down to 1200 and that was hard work. But don’t worry Sri Lanka is not like India or Indo – the Sri Lankans are generally very fair, but nevertheless still bargain. If you’d prefer to check out the capital, Colombo, a taxi should cost around Rs 2500 (17 USD) from one of the taxi counters inside the airport (no need to book ahead). Alternatively the airport bus only takes 40 minutes, costs peanuts at 110 rupees each and is easy to find. Turn left coming out of the airport, keep walking to the end, then turn right and you’ll see the buses up over to your left. We predominantly used private drivers to get around Sri Lanka – something that I’ve never done in any other country or even really come across whist travelling. As Sri Lanka is a compact little country, most distances take between 3-4 hours by car, much longer on public transport. We found using private drivers to be the easiest way as a family to get around with limited time, but it did take a chunk out of our budget. We also loved the fact we could stop whenever we wanted – if the girls needed a wee for example (as opposes to being on a bus without a toilet) and we could pull over if we fancied buying some fruit from a roadside stall, if we saw wild elephants on the road or if simply wanted to take a photo. 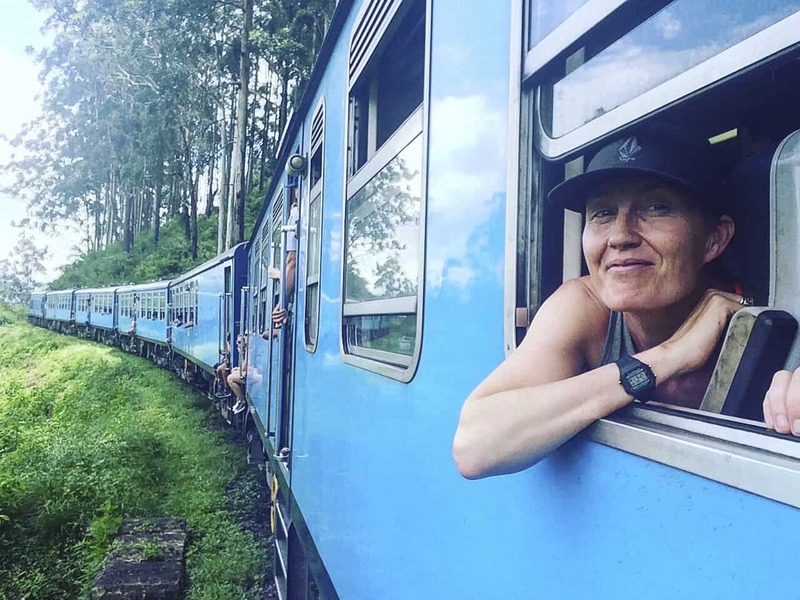 If we had been travelling Sri Lanka for a longer period, we would definitely have prioritised taking cheaper public transport, the bus or the train. Note: if you are not a family travelling, but a couple or travelling solo, then getting a private driver would not work out as economical for you as it was for us, unless you found some buddies to share. Most hotels and guest-houses can easily arrange a private driver. 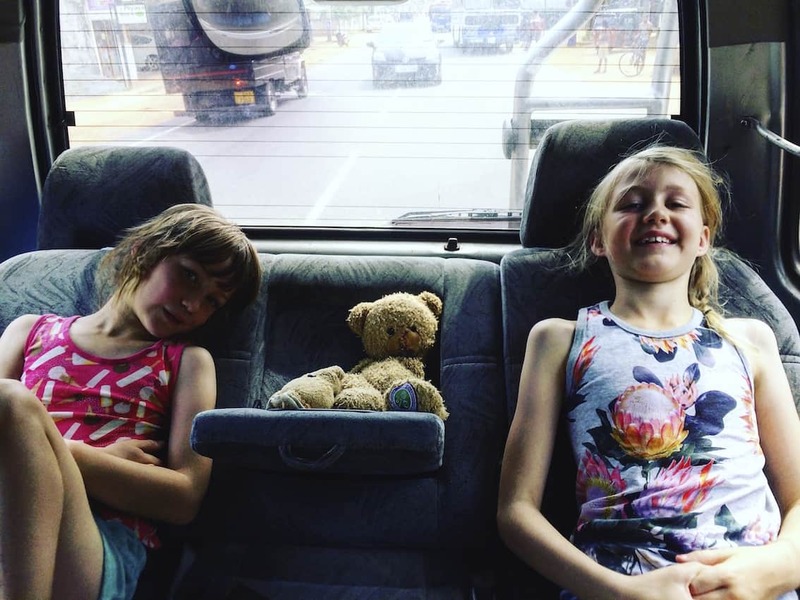 One word of warning – there are rarely seatbelts in the back of private cabs, which was a slight concern for us travelling with kids. Driving on Sri Lanka roads is quite chaotic, so if you feel unsafe with your driver, ask them to slow down – most of them respect your wishes. We can highly recommend our driver Pradeep who can be contacted on facebook to pre-organise transport. DM me on our facebook page @thefamilyfreestylers if you’d like his contact. He is also able to organise private drivers around almost all of the island and his prices are always cheaper than arranging direct with a hotel or guest house. Many of our friends have used Pradeep – he is trustworthy and reliable. If you wish to tip your driver Rs500 is the suggested normal rate. Rs9000 (£45) one way from Negombo to Kandy. 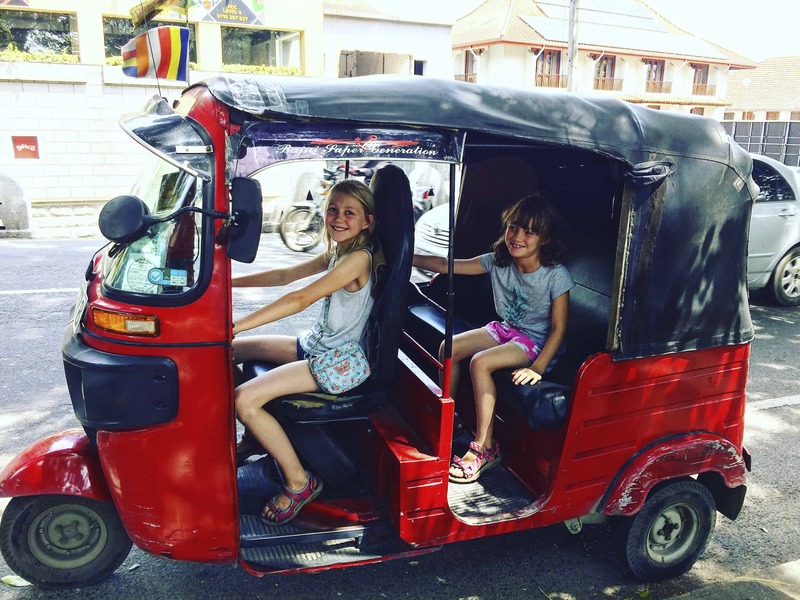 We love tuk tuks and use them for all short distance journeys. 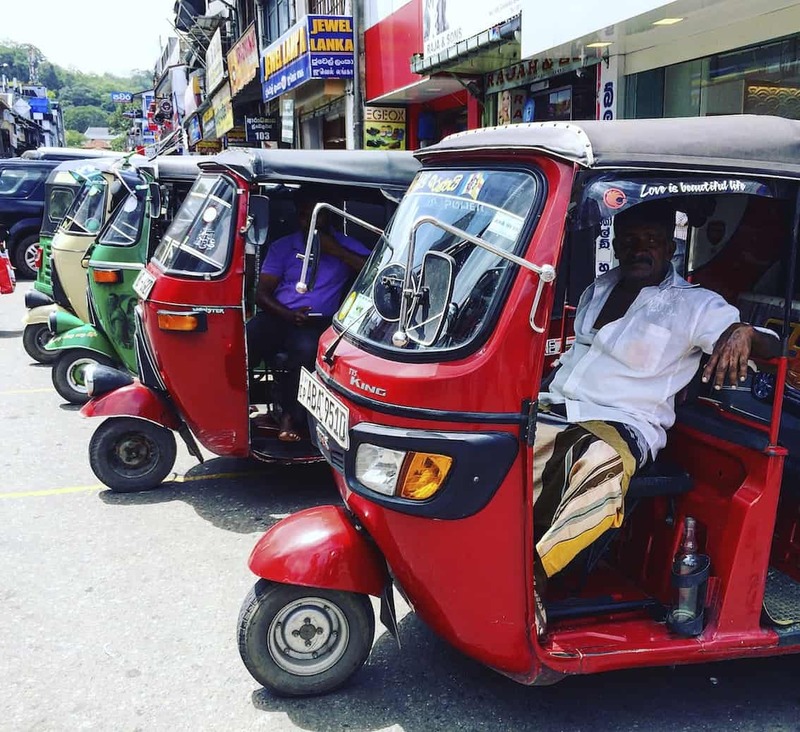 It is also possible to rent tuk tuks and this is something we will definitely consider on our next trip to Sri Lanka. Rail travel is limited somewhat across Sri Lanka with lines mainly from Colombo to Kandy, Colombo down the West coast to Galle, Kandy to Ella, Trincomalee to Colombo and Colombo to Jaffna. The railways were primarily built for trade, transporting tea from the hill country to ports for export. Word of warning; Do not take night trains or buses without a male chaperon. Even local women do not do this and it’s taking an unnecessary risk. Children under 12 pay half fare with Sri Lanka Railways, children under 3 travel free. Carriages are either reserved or unreserved. Seats in the reserved carriages can be booked up to 30 days in advance. If you buy a ticket for a reserved carriage you are guaranteed a seat and a specific seat number will be printed on your ticket. The reserved carriages have a guard on who will stop anyone from entering who does not have a specific ticket for that carriage. No-body is allowed to stand, so reserved carriages are not crowded. Tickets for first class reserved and first class observation carriages, and sometimes even second class reserved sell out quite quickly after tickets are released on sale, so it’s a good idea to book tickets from outside Sri Lanka before you arrive with Visit Sri Lanka Tours. First class observation carriages have larger glass windows, but they don’t open so don’t book this carriage if you want to take photos out of the windows. If you are told at a railway station that a train is fully booked, they are talking about the ‘reserved’ carriages. A train is never fully booked so you can always turn up on the day and buy a ticket for an unreserved carriage. The Rajhadani Express runs twice a day from Colombo to Kandy. You can pre-book it up to two weeks in advance (and from outside of the country) with Visit Sri Lanka Tours. I’ve also heard you are now able to book via 12GoAsia (since Summer 18) although when I went on, I couldn’t seem to book for either the Rajhadani Express or the Kandy to Ella train! The first train departs at 7.00am arriving at 09.35am and the other departs at 15.35 arriving 18.05pm (these were the times when I visited so do check the schedule on www.seat61.com If you want to take in the wonderful Sri Lankan countryside on the way be sure to catch the morning train as you’ll arrive in darkness with the afternoon train. For the best views sit on the left hand side of the carriage with your back to the engine. Tickets are £1 for 2nd class or £3 for first class reserved if you book in Sri Lanka, or approximately £10 for second class & £11 for first class pre-booked before arriving in Sri Lanka with Visit Sri Lanka Tours. We worked out it was approximately the same cost to take the train from Colombo to Kandy as a private taxi from Negombo to Kandy for our family of four (if we pre-booked our tickets from the UK). The cost for four tickets for 2 adults and 2 kids, unreserved 2nd class one way was Rs610 (that’s an incredible £3.00!). I was really worried about getting seats because the journey was so long (7hrs) and we really wanted the kids to be able to have a seat. I’d stupidly thought that by rocking up the day before, I might still be able to get some. No way! This train is now fully on the tourist map, so during peak season forget about it. 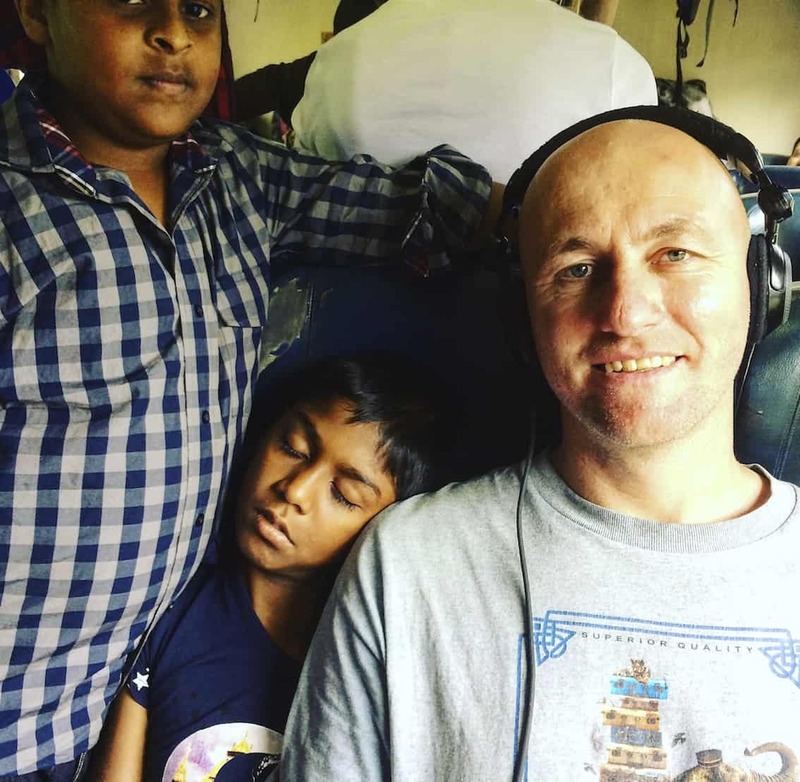 If you definitely want a seat with your family, I’d highly recommend booking before arriving in Sri Lanka (see how to above). I did meet a few travellers who had managed to buy reserved tickets off touts around the station, but I never was offered any so it’s a risk to leave it to chance. However, don’t fear if you can only get unreserved tickets. We followed a cunning tip that I’d read about that worked a treat. Our trick was to board a station earlier than Kandy to avoid fighting the throng of tourists and locals boarding in Kandy. We had a tuk tuk take us to Peradeniya, which is 5.5km west of Kandy (where the Botanical Gardens are) where we bought our tickets and waited slightly nervous as to how this would play out. We boarded the train with no bother and although the train was full, we stood until the train started slowing into Kandy station where most people started to get out of their seats. We nabbed four seats quickly and sat there extremely smug staring out of the window at the throng – a 6 person deep crowd trying to pour onto our unreserved carriage. However, after a few hours we ended up squishing up on our seats and letting kids sit with us – 7 hours is a long time to stand (!) and it was good to get to know some little locals a little better. Below are some of the real costs that we paid whilst in Sri Lanka (Aug 17). The rate at the time was Rs200 = £1. It will help you get an idea of how much you will need on a daily basis to budget. We actually spent far more than we expected to in Sri Lanka travelling as a family of four. Our highest expenditure was private drivers (see fares above) and tourist attractions. Prices in Sri Lanka are mostly in Sri Lankan rupees although many tours & accommodations quote in US dollars. Your next biggest cost will be accommodation. You can obviously choose to go budget, mid range or luxury, so your costs will vary here. Generally on average we spent around $50 a night for a non air-con room that we all shared (often the kids would top and tail a single bed). This of course was certainly not luxurious but was adequate, clean and cheap. The exception to this was in Ella where for once we weren’t paying out each day for tours or private drivers and so we chose to pay more and stay in the beautiful Zion View. The only other place we splashed out on accommodation was in Aruguam Bay, when the temperature rose to over 40 degrees and we were forced to leave our perfect (but non air-con) beach side cabana (Aloha Cababas $48) to move into more the more palatial surroundings of The Spice Trail ($180 a night) and Roccos ($93), where we had a the luxury of a pool and air con to keep us sane! You can see links to all of our accommodation in the itinerary above. Roccos have cubed ensuite rooms overlooking the pool so it’s great for parents watching kids play in the water. It’s also right on the beach. Sigiriya – Lions Rock US$30 or the equivalent in rupee – you can only pay in cash. Previously payment was ONLY in rupees but recent travellers say they’ve paid in US dollars. We saw wild elephants and loads of birds on our boat tour on the Pottuvil Lagoon which takes you over to Whiskey Point and back. The girls eagerly looked for crocs but we didn’t see any! Minnieyia National Park safari Rs12,200 (£60) + 3,000 tip – (under 5s free ). This was for a private jeep for our family. We also had to pay national park entry fee on top on the above costs on arrival. Departures from Sigirya – 13.30 for afternoon safari or 18.30 for evening safari. However we did have to visit the doctors again in Arugam Bay …. to get some iodine for a cut and have it looked at as it looked yakky. The surgery did look dirty, especially the bed to lie on (which we did not!). In fact, we could have easily picked up some iodine at the local supermarket for Rs150 …..rather than the Rs1000 we paid! Disclosure: This post also contains affiliate links to both booking.com and amazon. Should you click on a link to purchase, it is at no extra cost to you, but I get a small commission that goes towards the running of this blog. 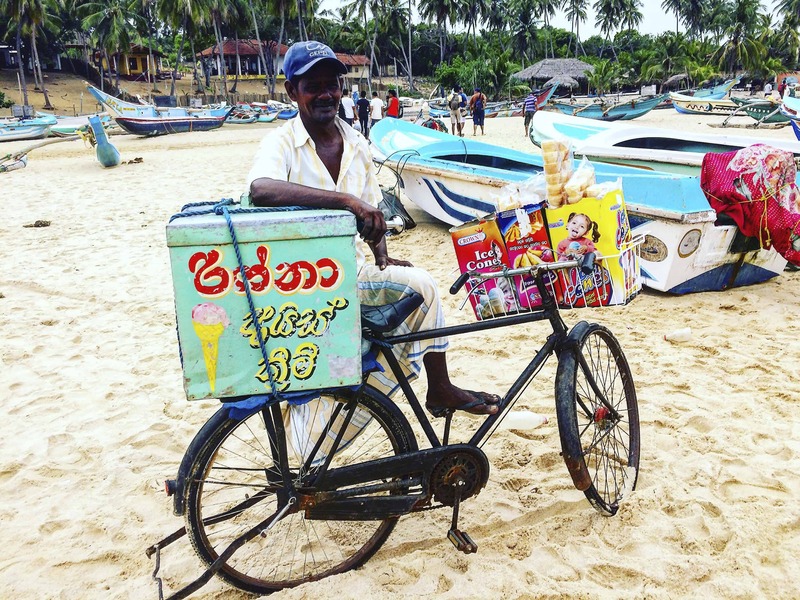 This is great and by far the best info and useful tips I have found on visiting Sri Lanka yet!! Looking at the photos makes me wish I was there now!! I am planning on going next year and will definitely contact the accommodation recommended and follow the other useful tips. Thank you so much, I have already forwarded this on to friends and will be following your blogs in the future. I am avid reader of your adventures. Just wanted to shoot a quick question if that’s OK. I am considering travelling with my family to Arugam Bay area in August 2019. I was wondering if the ocean is safe for kids (ours will be 8 and 10 y.o.)? Let us know. Hi Mehdi. Thanks for getting in touch. Great question! There’s a big swell on the East coast of Sri Lanka during the summer months which is why it’s such a famous surf spot. However the swell means safe swimming is limited to only a few places. We saw adults swimming no problem outside our cabanas (Aloha Cabanas) on the main beach, however I wouldn’t let my girls swim there at all. Arugam Bay is a crescent shaped bay and has a really safe spot right in the crux of the bay called Baby Bay (there’s a photo of Baby Bay on my post on Day 12). It is one of the most central places in A bay and only took us 5 – 10 mins to walk to each day. This is really safe as it’s quite shallow and it’s the only place we let our girls swim whilst we were at Arugam Bay. It’s also a great place for them to learn to surf. We got round this negative by making sure we booked some accommodation with a swimming pool for some of the time were were at A-Bay. Sri Lanka really is a fantastic destination – I wouldn’t let this put you off going – just book somewhere with a pool. We can highly recommend The Spice Trail, Hideaway or Roccos (links are in our post). Waow… Great thanks for the detailed answer… We are definitely going ! 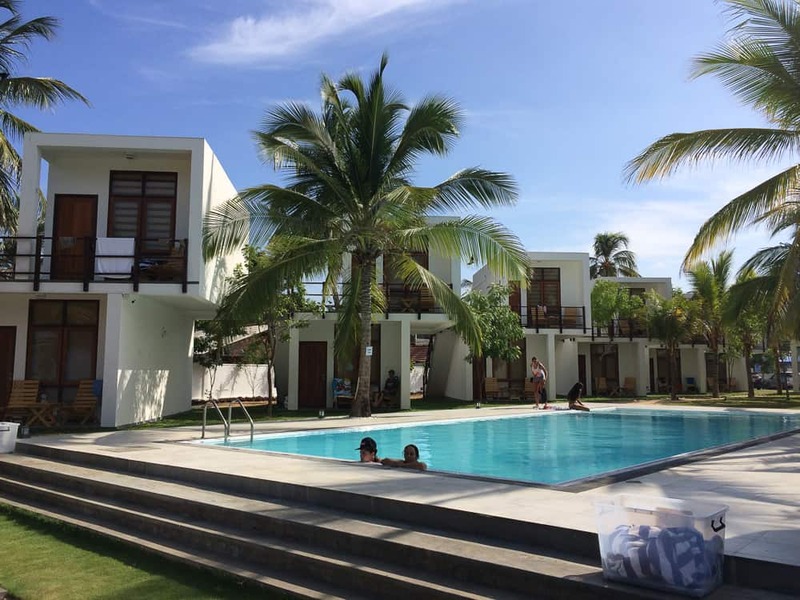 One last question if I may… Would you say that there is a beach walking distance from Hilltop Cabanas where you really inspired us to stay are suitable for children to swim? Many many thanks. No. The beach at Lighthouse Point is still quite rough. Our girls paddled there but we didn’t let them swim. We didn’t walk too far each way up the beach as the temperature was soooo hot – over 40 degrees, and there’s no shade at all on the beach. My advice is to only book for two nights at Hilltop Cabanas – it’s a great place to relax and chill (and surf) but as there’s no shade on the beach, the kids can only paddle before 08.00 or after 16.00 – 16.30 (when the sun becomes bearable) so there’s a lot of chilling in hammocks, playing chess and adventuring in the stilt cabanas. Sleeping in the outdoor open air cabanas is definitely the draw here. 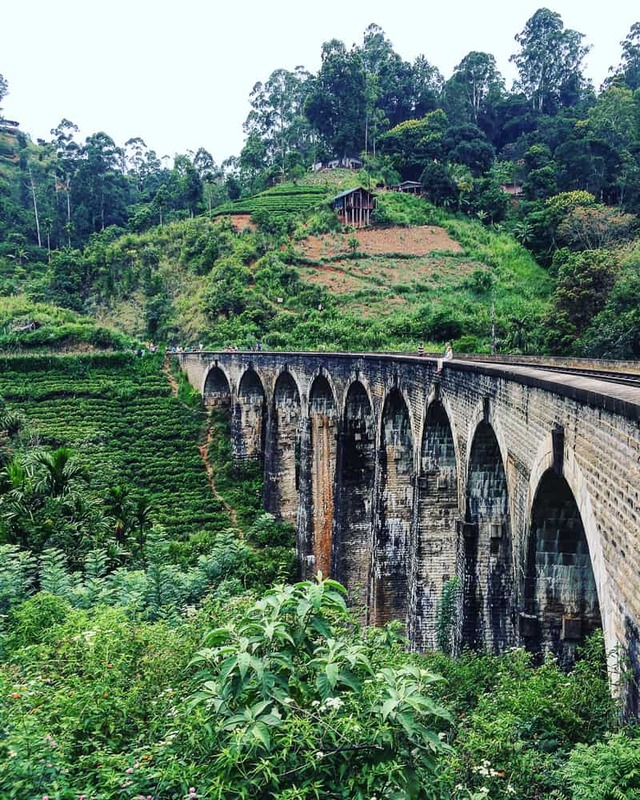 so happy I found your post about a three week itinerary for Sri Lanka in August! It’s exactly what I was looking for (and most other people seem to travel another month). And it’s great you added suggestions in case of travelling without kids! 1. Is Sri Lanka very crowded/touristy in August (even though it’s an all year round destination) regarding the places you visited? seem to be very expensive in the month of August 800 Euros. I’m so pleased that our post has been helpful to you. We didn’t find it too touristy in August. Of course yes there are tourists, especially at the popular attractions but it wasn’t ridiculously so. I think flights are always cheaper from the UK though for some reason.